Villa Fostira is located in Latchi, Cyprus. 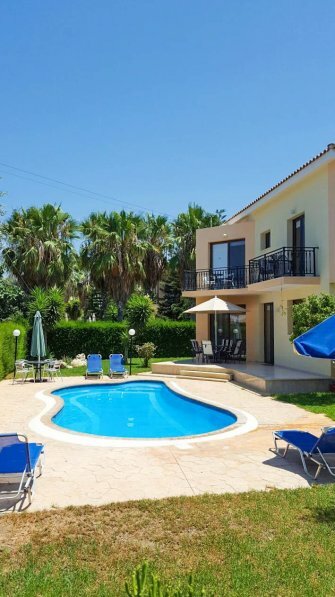 This detached vacation rental property is air-conditioned and sleeps up to 7 people with 3 bedrooms, 3 bathrooms along with private swimming pool. Villa Fostira is located in Latchi, Cyprus. This detached vacation rental property is air-conditioned and sleeps up to 7 people with 3 bedrooms, 3 bathrooms along with private swimming pool. The Villa is walking distance to the beach and restaurants. On the ground floor is a lounge, kitchen, dining area, from the dining area are French doors leading to the pool area. On the first floor is 1 double room and 2 twin rooms. There are 2 bathrooms (1 en suite). If an additional bed is required there is 1 folding bed. Villa Fostira can sleep up to 7 people.